TRULY A VERY UNIQUE AND RARE PIECE! A ONE OF A KIND PIECE YOU ARE NOT GOING TO FIND ANYWHERE ELSE. DELMONICO’S (NY Restaurant) Menu Card with 4 signatures of relevant HISTORICAL FIGURES OF THE ERA. PHILIPPE COMTE DE PARIS, PHILIPPE DUC D’ORLEANS, THOMAS A. EDISON, and GENERAL SICKLES. 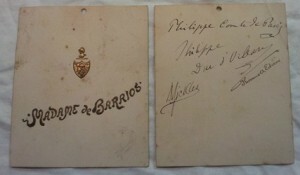 Acquired directly from the family of Francisca Aparicio v. De Barrios who was invited to the dinner. She was Widow of General Justo Rufino Barrios, President of Guatemala City and later became Marquise of Vistabella. a colorful and controversial American politician, Union general in the American Civil War, and diplomat. As an antebellum New York politician, Sickles was involved in a number of public scandals, most notably the killing of his wife’s lover, Philip Barton Key II, son of Francis Scott Key. He was acquitted with the first use of temporary insanity as a legal defense in U.S. history. He became one of the most prominent political generals of the Civil War. At the Battle of Gettysburg, he insubordinately moved his III Corps to a position in which it was virtually destroyed, an action that continues to generate controversy; despite this, he would eventually be awarded the Medal of Honor in 1897. His combat career ended at Gettysburg when his leg was struck by cannon fire. After the war, Sickles commanded military districts during Reconstruction, served as U.S. Minister to Spain, and eventually returned to the U.S. Congress, where he made important legislative contributions to the preservation of the Gettysburg Battlefield. was the grandson of Louis Philippe I, King of the French. He was Comte de Paris, and was a claimant to the French throne from 1848 until his death.A historian, journalist and outspoken democrat, the Count of Paris volunteered to serve as a Union Army officer in the American Civil War along with his younger brother, the Duke of Chartres. He was appointed as an assistant adjutant general with the rank of captain and served under the name of Philippe d’Orléans, the Count of Paris. He served on the staff of the commander of the Army of the Potomac, Major General George McClellan, for nearly a year. He distinguished himself during the unsuccessful Peninsular Campaign. His history of that war is considered a standard reference work. In 1864 he married his paternal first cousin Princess Marie Isabelle d’Orléans (1848–1919), Infanta of Spain. She was daughter of Infanta Luisa Fernanda of Spain and Prince Antoine, Duke of Montpensier (1824–1890), the youngest son of Louis-Philippe of France and Maria Amalia of Naples and Sicily. Orléanist claimant to the throne of France from 1894 to 1926. In February 1890 he visited Paris in violation of the law of exile of 1886. He offered to do his military service as required by law. Instead he was arrested and confined in the Conciegerie. He was sentenced to two years in prison at Clarvaux, but was released after a few months and expelled back to Switzerland. Prior to his imprisonment in France, Philippe had been unofficially engaged to his first-cousin Princess Marguerite of Orléans. The engagement was cancelled when Philippe’s involvement with the Australian opera singer Nellie Melba was revealed. Although they had lived apart for some years, Melba was married to Charles Nesbitt Armstrong. Armstrong filed for divorce from Melba on the grounds of adultery, naming Philippe as co-respondent; the case was eventually dropped. In September 1890 Philippe accompanied his father on a two month trip to the United States and Canada. They visited the battlefields of the Civil War in which his father had fought, as well as Philadelphia, Washington, D.C., Richmond, Virginia, New York, and Quebec.